The arrival of the V-10 isn't the end of the R8 story. This year, Audi will introduce an R8 Spyder convertible, and will show a concept R8 powered entirely by electricity. A shockingly fast V-12 TDI concept went on display last year, but its 500-hp diesel likely will never be sold to American Audiphiles-even though its 25-mpg fuel economy makes supreme sense anywhere in the world. The 2010 Audi R8 brings the expected Germanic, technical appeal to the supercar arena-but it's the imported Italian V-10 that reveals some true lust in its heart. Editors at TheCarConnection.com drove the 2010 Audi R8 to bring you this hands-on road test of its styling, performance, comfort, safety and features. TheCarConnection's experts also compared the new R8 to other exotic cars, to bring you the best shopping advice and information possible. The companion R8 review condenses opinions from other respected automotive sites, to bring you a summary of other opinions from around the Web.High Gear Media accepted travel expenses to San Francisco, to be among the first to drive the 2010 Audi R8. Editors drove various 2010 R8s on the road and track near Sonoma, California, to write this hands-on road test. Consider the 2010 Audi R8 an entry-level exotic car-entry-level only in reputation, possibly. Audi doesn't have the track record of Ferrari, Lamborghini or even the Corvette, but with the R8, and particularly the new V-10-powered R8, it's stepped without hesitation into the rarified world of ultra-performance machines. For the 2010 model year, the R8 adds a V-10 option and a handful of new features. The base price remains $115,400, but V-10 versions top out at $156,300 before options are added. From its audacious silhouette, to the "sideblades" that give it a vertical visual calling card, the Audi R8 looks every bit the exotic. Its low-flying wedge looks tailor-made for high-speed runs, and typical of Audi, even the most dramatic styling cues play some part in the car's staggering performance. Those sideblades don't merely make a technical appeal to your heart: they cloak extensive ductwork for engine cooling and brake venting. 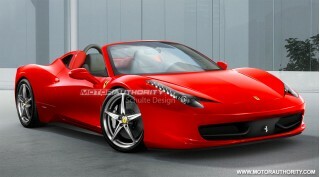 Likewise, the huge wheels staggered in size, front to back, look sharp-and aid in razor-sharp handling. Some frippery exists, but not much-you might call the nose's LED light bar a the glass engine cover that displays the LED-illuminated engine wasteful, but most of us will admire how it puts the powerplant on jewel-box display. The cabin? Useful and distinct in the mode of the original Acura NSX, with a low cowl, at-hand controls and a light touch of style-though plenty of buttons and controls dot the R8's dash. With the new ten-cylinder version comes some light visual differentiation too: the V-10 wears more black and chrome trim, wider side sills, gloss-black sideblades, oval exhaust pipes and a distinct set of gauges, gear shift knob and door handles. With the original V-8 coupe, Audi's supercar performance fell midpack among the $100,000-plus super coupes-somewhere among the Aston Martin Vantages, falling short of the Chevrolet Corvette ZR1 and Porsche 911 Turbo (not to mention the $80,000 Nissan GT-R.) The unchanged V-8 edition still doesn't feel particularly torquey, but its revvable 4.2-liter, 420-horsepower V-8 delivers brisk performance with either a six-speed manual or R-tronic automated manual shifter. The V-8 spins to 60 mph in 4.4 seconds, tops out at 187 mph and delivers up to 19 mpg in freeway driving along with a lushly mechanical whir. It's good enough to rush ahead of the Aston and 911s and other coupes, but the V-10 engine is clearly the category killer Audi intended all along. With a 5.2-liter, 525-hp ten-cylinder derived from the unit in the Lamborghini Gallardo, the R8 rips to 60 mph in about 3.7 seconds, tickles a near-200-mph top end (it's 196.4 mph, in case you need four sig figs) and overachieves with highway fuel economy of up to 20 mpg. The sound from the V-8 is a nice baritone, but not so loud that it brings on fatigue, while the V-10 imparts a distinct throaty roar that blends German and Italian timbres. Audi's cars are the most emotional of the German Big Three, and the R8 is easily the most expressive-looking and sounding car in their range. It's still a tick behind the Bugatti Veyrons and GT-Rs of the world, but the R8's newfound power vaults it into 911 Turbo territory. So, to tame the power reliably, Audi's fitted the V-10 with a "launch control" mode that preserves clutch life and directs power through its all-wheel-drive system to ensure repeatable, stunning 0-60 mph runs. The launch control helps give the transmissions more life, too. Of the available gearboxes, TheCarConnection's editors prefer the automated R-tronic setup. The manual gearbox has distinctive metal shift gates inside and shifts easily, though with a long throw; the R-tronic gearbox can shift roughly in leisurely driving, but it's the choice for track driving, where it nails down shifts faster than the most experienced drivers and blips the throttle expertly on downshifts to maintain control, without a clutch pedal. You don't have to drive the R8 at illegal speeds to enjoy it, though it sure does have a presence on the racetrack. The entire vehicle weighs only about 3,400 pounds and has a near-perfect (rear-biased) weight distribution to take advantage of the engines' location just behind the front seats. It's also fitted with a magnetorheological shock system, which uses magnetic force to adjust shock stiffness between Normal and Sport modes, which allows some leverage in driving off the beaten track. The R8's composure is in the direction of phenomenal: it feels hefty and stable at triple-digit speeds, while also managing to convey lightness and nimbleness at low speeds and more than reasonable ride quality. Meanwhile, the all-wheel-drive system, which can send up to 35 percent of torque to the front wheels, puts the power to the pavement without drama. With V-10 cars, Audi adapts new eight-piston brakes, 19-inch wheels and tweaks the suspension to capture all the R8's high-speed potential. The 2010 R8 is about five inches longer than the Lamborghini Gallardo (with which it's somewhat mechanically related) and has several more inches of seat travel and legroom than the Italian stallion; even tall people will find the R8 ample in space. Headroom isn't tight once you're in, but some might bump their head on entry or exit. The layout of the cockpit area is very driver-centric, like that of a racecar, with controls and displays angled toward the driver. The R8's interior lacks storage compartments and cubbies for small personal items, and cargo space is limited to a modest area underhood at the front of the car and a cargo shelf that's good only for a small duffel bag. Neither of the major U.S. crash-testing programs has put the R8 into a wall, andprobably won't because of its exclusivity and pricetag. However, TheCarConnection rates the R8 highly for safety since it takes a comprehensive approach to safety. Performance-oriented electronic stability control system is standard on the R8, along with side impact airbags and dual knee airbags. A set of front and rearview cameras are available on V-8 coupes-and recommended, since rear visibility isn't great-and standard on the V-10, along with LED headlamps. Standard features include power features; leather upholstery; an audio system with twin slots for SD cards, a CD changer, and Sirius satellite radio; and Bluetooth. Major options on the base R8 include carbon-fiber trim, upgraded leather upholstery, a navigation system, a parking-sensor system, and a premium Bang & Olufsen sound. For the V-10, the navigation system is standard and adds real-time traffic; the premium audio becomes standard as well, and Audi adds distinct colors and interior trims to the options list. Although its low silhouette and angular sideblades give the 2010 Audi R8 a bit of a stealth appearance, this isn't the kind of car that you can drive without attracting some serious attention. Super Bowl commercials are known as the supreme royalty of the advertising world, but simply getting a spot during the Big Game isn't enough; you still have to find a way to stand out. Audi did just that during the 2008 championship, when it debuted a Godfather-inspired spot that stole the show by relying almost exclusively on the Audi R8's breathtaking, almost sinister-looking exterior. The 2009 Audi R8 is an ultra-sleek, ultra-exotic sports coupe that gets a new trim level for 2010. Cars.com reports that the standard V-8-powered R8 remains as the base model, and Audi adds "V-10 models, called R8 5.2 FSI Quattro." The name may not be elegant, but the R8's styling sure is. Car and Driver is impressed by the "avant-garde" styling, and Edmunds notes that the visual upgrades to the V-10 R8's "just add more badass-edness to the way" the car looks. The 2010 Audi R8 appears to exist solely to attack roads-not drive on them, but pummel them into submission. What's most impressive about the styling is that Audi achieves the look not by throwing together a bunch of sharp angles, but by utilizing a "soft curvature of the hood and roof [that is] drawn together in one sweeping arc," as Kelley Blue Book describes it. They go on to declare that the Audi R8 is completely unique and "styled unlike anything else on the road, with sweeping arcs and muscular lines that are more suited to a concept car than a road-going one." In terms of distinctions between the V-8 and V-10 models, Automobile Magazine reports that the V-10s get "flared sideblades, extended sills, a larger rear diffuser, standard LED headlamps...and more chrome for the single-frame grille." The sideblades are one of the Audi R8's most distinguishing features, but Cars.com points out that they're more than simply aesthetic-they serve to "route air to the engine," which is situated behind the driver. The new 2010 Audi R8 simply appears so damn cool that Kelley Blue Book feels it "might not look out of place in the year 2109." Audi began designing the R8 with the intention of making it a feasible as a daily driver, and reviews read by TheCarConnection.com show that they've succeeded in creating a comfortable cockpit. Kelley Blue Book says "the controls couldn't be easier to reach and operate," and while Automobile considers the cabin to be "somewhat overstyled," ConsumerGuide appreciates that the "dashboard design mimics that of other Audis." The interior isn't without its flaws, however, as ConsumerGuide points out that the "CD changer mounts above the center floor tunnel just behind the seats," an awkward position no matter how flexible you may be. There are few interior differences between the two versions of the 2010 R8; Edmunds asserts that the only real change is the fact that "the top of the gearshift knob, speedo and tachometer also come etched with a red accent circle." With up to 525 horses in the 2010 Audi R8's stable and 1.2g of cornering grip at the wheels, it's hard not to drive the R8 like a hero. There aren't many occasions when 420 horsepower would be considered underpowered, but in the exclusive sandbox where the Audi R8 plays, 420 horses aren't enough to distinguish you from that GT-R in the corner. To rectify this situation, Audi drops a Lamborghini-sourced V-10 behind the cockpit of the R8, turning the Audi R8 into a Ferrari-stomping supercar. TheCarConnection.com read many reviews to prepare this report, and one thing quickly became clear during the research; as Car and Driver asserts, the new 2010 Audi R8 V-10 "is wickedly quick." Not that the V-8-powered R8 is slow-ConsumerGuide states that the "base" R8 still runs from "0-60 mph in 4.4 seconds with either transmission," but the V-10 cranks the performance factor up to 11. Automobile Magazine reports that the new V-10 engine in the R8 produces "525-hp" and "dishes up 391 instead of 317 lb-ft of torque," enough to push the Audi R8 along the "0-to-62-mph sprint [in] 3.9 seconds." Not only is the new V-10 strong, but according to Motor Trend it offers one of the broadest power curves in its class; they rave that the "output is astonishingly well distributed across the entire rev range, a consistent swelling from sub-2000 rpm to redline at a stratospheric 8700." For buyers interested in the eight-cylinder model, ConsumerGuide says that you won't be disappointed there, either, as the "torquey V8 delivers forceful but drama-free takeoffs" and "ample highway passing punch." While Audi has clearly begun to draw even with the Ferraris and GT-Rs of the world in terms of acceleration and power output, its automatic transmission still lags behind those featured on its competitors. Automobile Magazine cautions that the six-speed auto, dubbed R-tronic, "responds jerkily and somewhat reluctantly to impatient throttle orders" when in Drive, and Motor Trend calls it "not one of the worst, but neither is it one of the best." Fortunately, the available six-speed manual on the Audi R8 is a world-class transmission, and despite Audi's initial projections it has proven to be the more popular choice. Automobile Magazine describes the gears as "perfectly spaced and mated to a creamy yet meaty clutch," offering "short throws with sensuous connectivity." Motor Trend also digs through the suggestive metaphor box, declaring that the Audi R8's manual transmission "has a wonderful mechanical intimacy" whereby you "can actually feel its shift improve as the transmission oil warms up." While no supercar offers super-eco-friendly fuel economy numbers, the 2010 Audi R8 still leans toward the low end of the efficiency spectrum. The best EPA rating for the Audi R8 lineup comes on the V-10 model with the automatic transmission, which returns 13 mpg in the city and 20 on the highway, while the MT V-10 gets 12 mpg city and 20 mpg on the highway. The V-8 versions fare worse, surprisingly, earning a 12/19 mpg rating with the manual transmission and 13/18 mpg mark for the automatic. While these numbers can't match the Corvette ZR1 or Nissan GT-R, they blow the Ferrari F430's 11/16 mpg mark out of the water. One of Audi's loftiest goals, and certainly one of its most impressive accomplishments, is to create a supercar that blends world-class handling with a ride quality that could be deemed "livable" for a daily driver. All of the reviews surveyed by TheCarConnection.com show that the Audi R8 is an unqualified success on both counts, and Automobile Magazine claims that the "5.2-liter V-10-powered R8 is the new leader of the pack" in terms of "total dynamic balance." Although the R8 features Audi's trademark quattro all-wheel-drive system, Car and Driver reports that it "behaves a lot like a rear-drive car," as the majority of the R8's power is directed to the rear wheels. ConsumerGuide, typically home to a more conservative reviewership, remarks that the Audi R8 boasts "prodigious dry-road grip and virtually no body lean," while Motor Trend simply says that "in fast corners it stays level and immensely well glued." That's largely due to the absurdly high 1.2g of lateral grip that the Audi R8 registers in skidpad tests, a number that would make even F1 cars sweat. Fortunately, Audi doesn't sacrifice ride quality in its quest to make the R8 one of the best-handling cars on the road; ConsumerGuide points out that the R8's ride is "surprisingly comfortable," and Car and Driver appreciates that Audi includes "standard driver-adjustable magnetic shocks [that] let you choose a sporty or more comfortable setup." Audi intentionally creates an upscale, comfortable cabin in the 2010 Audi R8 that works as well Monday through Friday as it does during track weekends. Few purebred supercars make their reputation by going out of their way to be practical, but Audi takes a road less traveled by emphasizing both driver comfort and overall quality. Inside the two-place cockpit of the 2010 Audi R8, passengers will find a space that is significantly more accommodating than the cabins of most R8 competitors. Car and Driver reports that "driver and passenger travel in great comfort," while Automobile Magazine draws the inevitable comparison to the R8's Lamborghini cousin, stating that "the R8 offers more head- and legroom." In keeping with the Audi R8's impressive performance capabilities, ConsumerGuide says that the seats "have prominent side bolsters that hold occupants secure in fast direction changes," but also offer a "combination of support for your shoulders and lower back [that] is just right," according to Edmunds. While the 2010 Audi R8's seats might be suitable for long-range touring, the limited cargo capacity could put a crimp in any weekend plans you have for the R8. Despite its imposing exterior, the 2010 Audi R8's trunk offers "a paltry 3.5-cubic-foot-box in the nose," while a "slim shelf behind the seats can stow a couple of jackets or small bags, but little else," warns ConsumerGuide. The total cargo capacity of the 2010 Audi R8 is, according to Automobile Magazine, just "6.7 cubic feet," and that's with both the trunk and cabin storage areas occupied. The 2010 Audi R8 does manage to redeem some points lost in the cargo space category by stepping up build and materials quality. Audi has clearly considered its upscale image when crafting the Audi R8's interior, and ConsumerGuide proclaims that the "R8 doesn't disappoint" in terms of workmanship, with "high-quality plastics and fabrics applied with obvious care." Kelley Blue Book admires that the R8 is "every bit as luxurious as it is sporting," which is to say very. Some elements of the interior may look familiar to Audi TT drivers; that's because Car and Driver says "the center console and the dashboard make liberal use of TT parts, but the TT has one of the best interiors in its class, and the R8's still shines above the competition." Although the 2010 Audi R8 is a very light vehicle, Audi engineers still manage to deliver impressive acoustic isolation. Car and Driver observes that the sleek R8 is "noticeably quieter than the super-loud Lambo," while ConsumerGuide calls the Audi R8 "quiet and comfortable enough for daily commuting." The 2010 Audi R8 boasts plenty of safety gear, with the expected poor rearward visibility of a supercar. The 2010 Audi R8 hasn't yet been crash tested by either NHTSA or the IIHS, and given the R8's price tag and limited production, it probably won't be tested anytime soon. Fortunately, the 2010 Audi R8 comes loaded with a number of standard safety features, and TheCarConnection.com's editors have enough confidence in the Audi R8's features to give it a score of 9 out of 10 in this category. Both versions of the 2010 Audi R8 boast numerous standard safety features, including industry-first full LED headlamps, which provide better and quicker illumination than standard headlights. Cars.com lists some of the R8's standard safety items as "four-wheel-disc antilock brakes with traction control" and an excellent "electronic stability system" that is driver-controllable. The 2010 Audi R8 also features Audi's supremely capable quattro all-wheel-drive system, which provides prodigious amounts of grip and stability in adverse driving conditions. The latest R8 includes the standard complement of airbags, featuring both seat-mounted side-impact airbags and a driver's knee airbag. Although the 2010 Audi R8 comes well-equipped in the safety feature department, it still suffers from one major safety flaw: poor driver visibility. The view out of the spacious windshield is more than adequate, but ConsumerGuide warns that drivers will be faced with a "restricted aft and over-the-shoulder" view thanks to the "wide ‘flying buttress' rear-roof pillars and narrow rear-window opening." Fortunately, Audi makes a rearview camera available on both models of the R8, and these should aid significantly in parking-lot maneuvers. 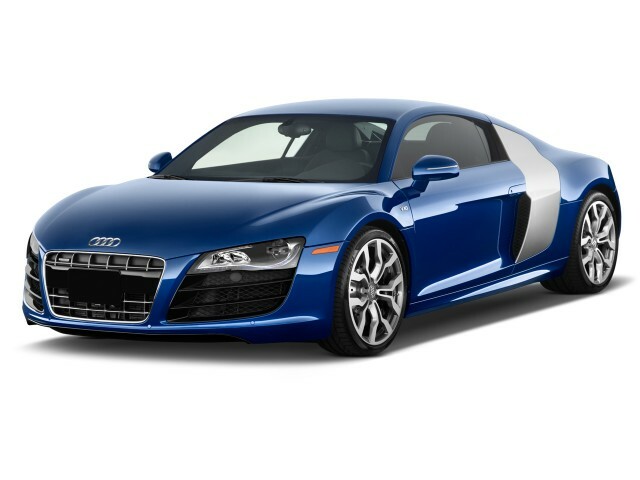 The 2010 Audi R8 offers features that are competitive or superior to those in many GT cars in its price range. With the economy still in shambles despite months of positive news on Wall Street, Audi recognizes that buyers are looking for value in their automotive purchases, even at the Audi R8's price point. Accordingly, Audi packs the 2010 Audi R8 with high-end features, and even the $150,000-plus Audi R8 5.2 finds a way to justify its price tag. The 2010 Audi R8 is available in two trim levels, which are primarily distinguished by the engine that sits behind the cockpit. However, the two models also have a few feature differences; Kelley Blue Book points out that both versions of the Audi R8 get "Bluetooth hands-free phone connectivity and Homelink," but the V-10 version also upgrades with a standard navigation system and real-time traffic, along with an impressive 465-watt Bang & Olufsen stereo. Cars.com reports that V-8 buyers can upgrade to the "navigation system with Audi's Multi Media Interface," but ConsumerGuide warns that the MMI "complicates many adjustments" to the audio system. TheCarConnection.com's own editors, however, find the navigation system relatively easy to program, and the 3D graphics are both intuitive and aesthetically impressive. The 2010 Audi R8 lineup offers three major options packages, according to Kelley Blue Book, which lists them as the "Premium Package," "Leather Package," and the "Enhanced Leather Package." The Premium Package bundles a hill-start-assist feature with Audi's parking assist technology, while the two leather packages add varying degrees of plush Nappa leather to the interior. None of the packages is available on the Audi R8 5.2, since the included equipment is already standard on the V-10 model of Audi's supercar.